Tom Takesue is an unlikely movie star, but as it turned out, he was just waiting for someone to give him a script, as his granddaughter Kimi Takesue learned in passing hers along to him. A man who quietly spends his golden years with his TV tuned to black-and-white Asian cinema, Tom isn’t exactly Toshiro Mifune, even as deftly as he can wield a knife to make himself breakfast, but his interests are aroused by his granddaughter’s screenplay for a sweeping romance of a couple drawn together after tragedy, something he can relate to following the death of his wife. While Kimi’s intended narrative feature debut never actually made it before cameras, she was wise enough to turn one on Tom as he became reenergized by pondering the possibilities of it and in the process, opening up on his own past. As it turns out in the moving film that resulted, “95 and 6 to Go,” which makes its New York City premiere this week at DOC NYC, Tom’s life story is as intriguing as any fictional one could be, recalling a life spent in the dreamy landscape of Hawaii where more than a few of his own dreams weren’t fulfilled as he served as a dutiful husband and letter carrier for the U.S. postal service. The waves outside Tom’s home augur the largely calm but consistent roiling of feelings from within that his granddaughter gradually and skillfully draws out, finding both pangs of frustration and joy that have been long suppressed. 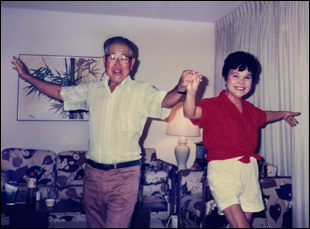 Following a triumphant screening earlier this week at the Hawaii Film Festival, Takesue spoke forging this unexpected relationship with her grandfather late in his life — he passed away in 2011 — and, in reflecting her subject, artfully telling a personal story. This project evolved in an unusual way because in 2005, I was in full development on a feature film script that had quite a bit of momentum. 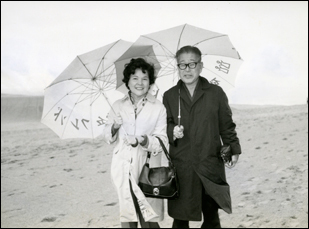 It was a cross-cultural love story and I had a very well-known Japanese actor and a well-known America actress attached. It was looking like it was going to happen and I brought the script to Hawaii to work on [where] my grandparents read it. It was really, really surprising to me, especially with my grandfather because after reading it, it seemed to incite something in him that I had never seen before – this kind of creative dimension. He started to have these ideas about titles and songs and different endings for the film. That’s really what triggered me filming him was because it was so unusual — I’d never seen this side of him at all. I started to film him in 2005 and then I went back right before the holidays in 2007 after my grandmother had died and it was the first time I had spent alone with him in my entire life. He was always much more of a peripheral person because my grandmother actually [felt like] the star – she was really magnetic and I was very, very close to her, and I really didn’t know my grandfather that well. He was always very hardworking and busy. So after my grandmother died, I spent several months with him, helping him through that transition period and that’s where the majority of the film takes place. He was going through this moment of real transition and I’m going through a moment of real transition because in that time period, the film had not gotten financed, so my life is really in limbo. Through this film project, it became this vehicle for us to have this conversation about his life and memories of love and loss emerging through [talking] about the script [for the narrative film]. Did you know from the start that you’d actually ever share this with audiences or was this simply intended for your own records? It really wasn’t until the very end before he died when he provided the title of the film that I thought I would be able to share it with people. At one point in the film, he [actually] says, “I don’t want you to show this to anyone,” and there were other moments that are much more stronger in his resistance to the material being shown. Part of it, I think, was his own privacy, but also just also the general Asian privacy about life [where it’s impolite to] air your dirty laundry, so he was very adamant about the material not being shown to anyone and honestly, I would’ve honored his wish. But I did feel compelled still to film him because I knew it was really special and unusual. I also knew for myself I needed to do it, and it came as a big surprise to me when he comes up with the title of the film and expressed that he wants a film to be made about him. That’s when I then realized that it could possibly be something then for an audience, but even at that point, the gathering of the material had been so organic, it wasn’t like I was thinking about the structure for a film. I never had edited any of that material and I didn’t actually start until a couple of years after he passed away. So I let all the material settle and then I went back to it and discovered what the film could be and what the structure could be because the different strands of his story and figuring out how to interweave them in a way that would make sense was actually pretty complicated. It would seem then that the square framing was simply because that was the camera presentation available to you, but it also seems like the compositions are so much more thought out than any typical home movie. It was originally shot on Standard Definition, so that is the format, the 4:3, and it was up-rezzed and everything, but I brought as much attention I could to the frame and to composition. I do a lot of shooting of my observational documentary work and usually, it’s quite stylized in that sense. They’re pretty formal compositions and one of the things I’m interested in is that interplay between a very formal frame where composition is really, really considered and yet also there’s the spontaneity that’s happening in the frame because I’m not controlling it. Sometimes people think something has been staged, but it’s not — I’ve just really set a really considered frame. In this film, I tried to do some of that, but I certainly am much more involved in terms of my interaction with him and I don’t have the same distance that I often do. Sometimes I’m there setting frames and just letting the camera roll because he wasn’t a completely easy subject, so I had to be very low key about the presence of the camera, and I had to let go of that control, but I also tried to capture some of those rhythms of his life that I felt were so fascinating, whether it be doing the 60 push-ups [in the morning] or the different contraptions that he has for his exercise or his [other] daily rituals. I was very conscious that those shots that are a bit more formal and maybe a bit longer in duration, but they were there to serve an understanding of his character — that this is a guy who’s tough and who perseveres. I was also really interested in the pacing of the film and providing these different moments to pause and of reflection. That’s why you have those interludes of all the landscapes that surround him – there’s this contrast between the beauty around him and the fact that we are on this island and he metaphorically in so many ways is a self-sufficient island unto himself. He really has his own little world that he’s created, and because the whole story takes place within his home, you want these moments of release and escape and that visual respite gives people [time] to enjoy some of the beauty of Hawaii. You have to tell me how the scene where he’s lighting fireworks on New Year’s came about? Sparks literally fly. That’s just him. He probably did that for me because I was visiting – again, I didn’t ask him to do anything. One of the things I felt so fascinating about him was all these little Tom-isms, and that was a ritual of New Year’s where he’s grilling the steaks and he has his whole method of the barbecue with the fan and getting the charcoal hot the quickest way. With the fireworks, the way he rigged those fireworks with his rope and the trash cans to keep it all contained – it’s so revealing because after all the fireworks go off, he says, “Oh, I’ve got to clean the place up” the second they’re finished. There’s no moment of celebration. He’s immediately going back to a practical side and it was fascinating to see that swing happening throughout the film between a romanticism that you can see in his ideas around the script and the reality of his life [where] he’s incredibly stoic and practical and cold emotionally. How did you figure out your grandmother’s presence in the film? I hadn’t filmed her much and even though my grandfather expressed resistance to this film being shown initially, he actually was a completely unself-conscious subject. He really did not change for the camera, which I thought was very, very unusual and one of the things that attracted me to filming him because he really wasn’t performing. He really is extremely frank and honest. My grandmother was definitely more aware and more self-conscious and there was only a little bit of filming that took place prior to her death, but I definitely wanted to introduce her in the film because he paints such a different picture of her after she’s died. Certainly in his story of meeting her, there’s a dramatic contradiction in terms of how he first tells the story of meeting her versus when they tell it together in her version of it, and I thought it was very important to see that contrast. Part of the film is exploring the way we tell our own narratives and [how] they are constructed narratives — there’s no single truth, so there are contradictions in the narratives that we tell. Of course, there’s also the fiction of the script [that’s the impetus for the film] and a certain degree of rewriting one’s own story that’s happening too. Because you spent some time away from the footage, was it interesting revisiting it with some distance in between? Yeah, that always often comes into play with my work. I often go into something in a more exploratory way and when you go into a situation without a clear plan and agenda, you allow things to happen more organically and you’re able to see things a little more spontaneously. Having some time to reflect over a span of six years – it was a long period and of course, I had forgotten moments, like I didn’t remember my grandparents talking about how they had met – and there were a lot of discoveries and it was literally like getting to visit with them. Also I think there’s so many things that this film documents that are important about that generation of Japanese-Americans in Hawaii and this unusual blend of very American and very Japanese identity that they were able to retain differently because they weren’t interned, so they stayed a lot more connected to Japanese culture. There are so many details about that generation that have now disappeared and it’s really special for me that it’s been documented. Is your narrative feature still alive or is this the way we’re going to see it? [laughs] Well, that project was really fraught with a lot of challenges and it’s very, very sad on one hand. When the film fell apart, it was when the [economic] crash happened and that really had been my window to work on it because I had a Guggenheim [grant] and some of these really special opportunities in terms of funding. Once that window closed up, I really did have to move into high gear in terms of getting work and I followed my grandfather’s advice – I did a little bit of television producing and I got into teaching. So ironically, that really devastating setback of not having that film made ended up pushing me into clarifying my career, which really was essential for me. I’m a tenured associate professor at Rutgers, I teach filmmaking and it’s really important for me to have that stability. I don’t know if I ever will return to that film because I think projects emerge at different points in your life, you’re invested in them and you change and you grow, so some of these projects have a moment and I think I would have to find a new level of energy and passion with it. I was pretty depleted after that, but the beauty is that this other very unexpected project emerged. On a personal level, it’s one of the things I learned through making this film – the idea that it’s so easy to overlook and underestimate those even very close to us. 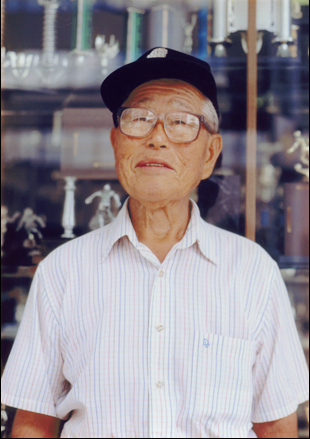 The fiction script became the anchor point to have this other conversation and I learned so much about my grandfather in terms of the complexity of his life and the struggles that he had endured, but also the creativity and the sense of humor and so many of these other layers of him. There’s a lot going on in people that we sometimes don’t tap into or there isn’t time to. or there doesn’t seem to be an interest. My grandfather was resistant to the idea of his life being important and that’s why he couldn’t necessarily speak about his life just on his own terms, but we had to have this circuitous route through his life through the script and I think it’s also a reminder that there’s so much creativity in people that they never get to pursue. My grandfather wasn’t able to afford to go to college and artistically, he never got to pursue some of his interests, so he had some things stored within him. That was a wonderful revelation and I think that applies to a lot of people out there. “95 and 6 to Go” will make its New York premiere at the DOC NYC Fest at the IFC Center on November 12th at 5:15 pm. Future screenings and dates can be found here. Interview: Robert Schwartzman on His Trip to "Dreamland"